India's GSLV Mk III rocket, which the country's space agency plans to use for human missions to space, most recently launched on June 5, 2017. Indian engineers have a new, ambitious timeline for putting its astronauts in space, according to a recent set of comments from government leaders, who say the country will achieve the feat by 2022. According to reports by the Hindustan Times, the timeline was a surprise to the Indian Space Research Organisation (ISRO), but the agency has been working on human spaceflight issues since 2004 and said it doesn't expect to have trouble meeting the schedule. "Our country has made great progress in space," Prime Minister Narendra Modi said during a speech on Aug. 15 to mark the country's independence day, according to a translation by the Planetary Society, a nonprofit organization dedicated to promoting space exploration and science. "But our scientists have a dream. By 2022, when it would be 75 years of Independence, an Indian — be it a man or a woman — will go to space with the tricolor flag in their hands." The newly scheduled mission series is being called Gaganyaan. So far, only one Indian has been to space: Rakesh Sharma, who completed a mission in 1984 and who is planning to advise the current effort. 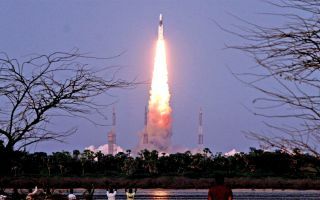 But unlike Sharma's flight, this series of missions — which is due to begin in 2020 with uncrewed test flights before progressing to crewed flights — will be entirely overseen by ISRO. The agency has already developed the rocket it would use for these flights, the GSLV Mk III, which has launched twice to date. Earlier this year, the country also tested the escape system for its crew module. But the team behind Gaganyaan have plenty of tasks left to tackle, including selecting and training crewmembers, perfecting a spacesuit design, preparing launch pads and developing the astronauts' expertise in bioscience. The government estimates the project could create 15,000 jobs, according to the Hindustan Times, and it could cost the equivalent of about $1.3 billion. After ISRO is satisfied the technology is ready for humans to use, the agency would send a crew of three astronauts to orbit for five to seven days at an altitude of between 180 and 250 miles (300 and 400 kilometers), according to the Hindustan Times. That altitude is about the same as the one used by the International Space Station as it orbits Earth.